What Bottled Water Is Safe for Babies? Which Water Is Best to Use in Baby Bottles? When you make the decision to formula-feed, the issue of which kind of water–bottled or tap–is best to use in your baby's bottle comes up. Powdered and liquid concentrate formulas that require only the addition of water make bottle feeding less expensive than more costly "ready-to-feed" brands. New parents are often concerned that the fluoride in tap water may be hazardous to their baby's dental health. Children under the age of 8 who are exposed to numerous sources of fluoride are at risk for a cosmetic dental concern called enamel fluorosis, says Mayo Clinic doctor Jay L. Hoecker. Fluorosis is characterized by faint white streaks that affect your baby's incoming teeth and permanent teeth. According to the Centers for Disease Control (CDC), manufacturers of baby formula take great care to ensure that the formula contains low amounts of fluoride. However, when mixed with fluoridated water and used as your baby's sole or primary source of nutrition, the formula in your baby's bottle can increase her fluoride levels above the recommended amount. Because infants rely on liquid intake for the first 4 to 6 months after birth, as well as a continued high level of fluids up to 1 year, fluoride intake from liquids is usually higher in younger children compared to older children, teens and adults, says the CDC. Tap water is usually safe to use in bottle feedings, provided that it doesn't contain high amounts of fluoride. 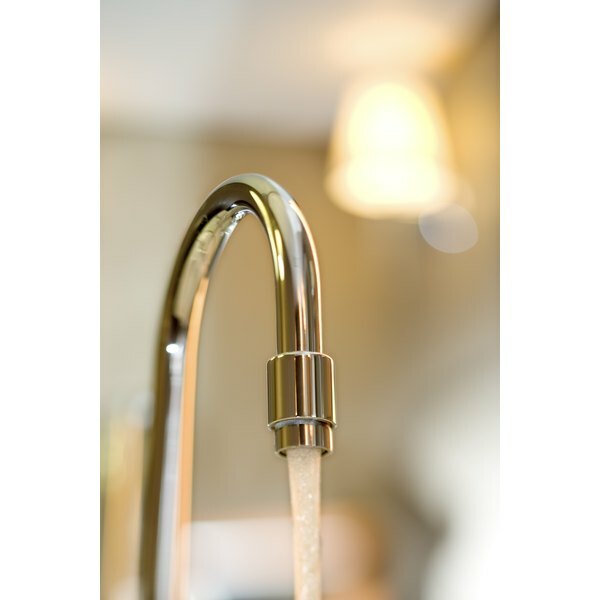 Check with your local water utility to see how much natural fluoride is in your water supply, advises the CDC. Fluoride may be present in well water as well. If the fluoride in your water supply exceeds 0.7 mg/L, you may wish to use another water source. Low- or no-fluoride bottled water to look for at your market may be labeled as purified, demineralized, distilled, deoinized or processed through reverse osmosis. Some bottled waters are manufactured expressly for use in preparing infant formulas and market themselves as such, says the FDA. If the label on the water specifies that the product is made for babies, it must adhere to the same standards established for tap water established by the Environmental Protection Agency. Additionally, the label must include the disclaimer that the water is not sterile. Stricter standards are in place for manufacturers who make and sell sterile water for use in baby formulas. Water with optimal amounts of fluoride is safe for your baby. If you use tap water, bring it to a boil for 1 minute to sterilize it, the FDA suggests, or follow the instructions on the formula's label. If you use bottled water, the CDC advises you to keep in mind that there's no requirement that manufacturers specify the amount of fluoride the water contains. Contact the manufacturer to find out the fluoride level in the brand of bottled water you intend to use. Parents who use non-fluoridated water to prepare baby formula may want to talk to the baby's doctor about fluoride supplements, which are taken around the age of 6 months, says Hoecker. The CDC states that your child is no more at risk for developing enamel fluorisis from infant formula than infants from previous generations, as the overall amount of fluoride consumed has not increased. If water quality is of concern, Hoecker suggests alternating use of tap water and non-fluoridated bottle water when preparing your baby's bottle. Mayo Clinic: Infant Formula-Is Tap or Bottled Water Better? What Are the Benefits of Rice Water for Babies? Can Infants Drink Electrolyte Water?